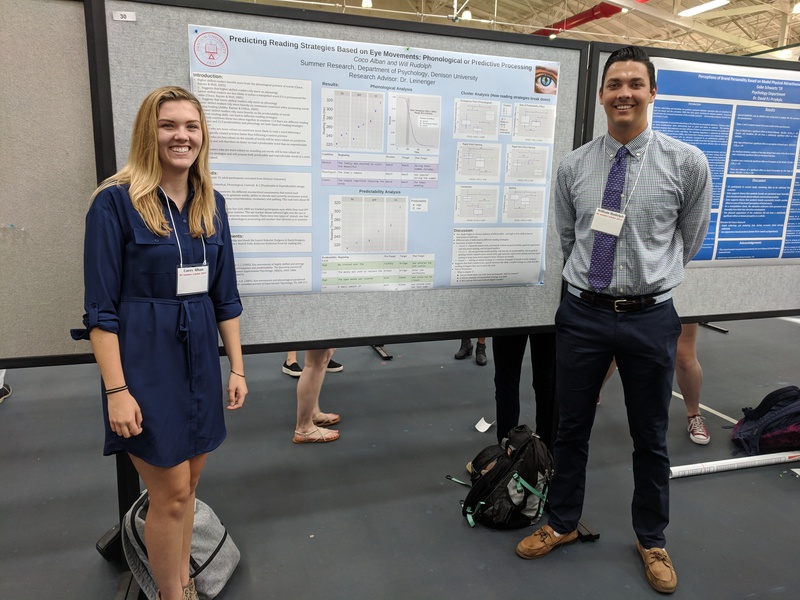 This past summer, Coco Alban ’20 and Will Rudolph ’20 worked as summer researchers in the LVCL. They collected eye tracking and language assessment data to investigate the relationship between online reading strategies and different cognitive-linguistic skills. Their research was highlighted briefly in the Summer Scholars video below. On Sept. 13, 2018 they presented their results at the Summer Scholars Symposium at Denison University. This entry was posted in Uncategorized on September 14, 2018 by mleinenger. This entry was posted in Uncategorized on September 15, 2017 by mleinenger. In August 2016 I will be starting as an Assistant Professor in the Department of Psychology at Denison University, just outside of Columbus Ohio. This entry was posted in Uncategorized on March 2, 2016 by mleinenger. Next quarter (Winter Quarter 2016) I will be teaching The Psychology of Reading at UCSD. The class may be of interest to students from psychology, linguistics, cognitive science, and beyond. The course will revolve largely around in class discussions, and I am really looking forward to teaching and exploring this topic with you! This entry was posted in Uncategorized on December 9, 2015 by mleinenger. I am a Phd Candidate in Cognitive Psychology working in the Rayner Eye Tracking Lab at the University of California, San Diego. Please click on the links above to learn more about my research and teaching. This entry was posted in Uncategorized on December 4, 2015 by mleinenger.